Currently, the global annual production of coir fiber is about 350,000 metric tons (MT). Yet, even in the world’s top two producers, India and Sri Lanka, which account for about 90% of global coir fiber production, combined, this renewable resource is underutilized; local coir mills process only a fraction of the available husks, which accrue more or less year round as a waste during coconut processing. Traditional uses for the resilient and durable coir fiber include rope and twine, brooms and brushes, doormats, rugs, mattresses and other upholstery, often in the form of rubberized coir pads. In the 1980s and 90s, global exports of coir fiber fell by almost half, as Western consumers shifted to synthetic foam and fibers. Then, since 1990, rapidly growing domestic demand in India more than doubled global production benefiting exclusively the Indian coir industry. Finally, since 2001, a rising Chinese demand for coir, an expanding market for coir-based erosion control products, and the spread of coir pith as a peat moss substitute in horticulture has further pushed up global production and prices. In turn, other coconut growing countries, including Philippines, Thailand and Vietnam are now expanding their production and export of coir fiber. These changes are also reflected in the international trade in coir. Historically, Sri Lanka had been the world’s largest exporter of various fiber grades, whereas India exports largely value added products – yarn, mats, and rugs. While in 1990 about 80% of global production was exported, growth of the Indian domestic market dropped that rate to below 40%. Global trade volume for coir fiber, value added products – yarn, mats, rugs – and coir pith now stands at about $140 million per year with India and Sri Lanka respectively accounting for about $70 and $60 million of that amount. This may not seem much but in the coconut regions of producing countries coir is an important economic factor. In Sri Lanka, coir related exports account for 6% of agricultural exports, over 1% of all exports and 0.35% of GDP. 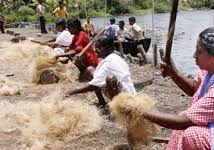 Moreover, coir milling and value addition, mostly spinning and weaving, are important regional employers, particularly in rural Southern India and coastal Sri Lanka. They give work to 500,000+ people, many of them women working part-time. Yet, working conditions and productivity are generally poor. The challenge for industry is to sustainably expand markets for this versatile renewable resource while maintaining its role as employer for the rural poor. This may require producers to innovate production, improve product consistency, and in particular develop novel applications – jointly with their customers in importing countries. Businesses, public agencies and research institutes are now addressing this challenge in multilateral projects worldwide – setting examples that global trade can be beneficial to all parties involved. Indian coir industry is an important cottage industry contributing significantly to the economy of the major coconut growing States and Union Territories, i.e., Kerala, Tamil nadu, Andhra Pradesh, Karnataka, Maharashtra, Goa, Orissa, Assam, Andaman & Nicobar, Lakshadweed, Pondicherry, etc. About .5.5 lakh persons get employment, mostly part time, in this industry. The exports from this industry are around Rs. 70 crores. Coconut husk is the basic raw material for coir products. 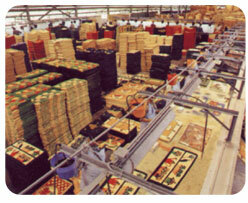 Around 50 per cent of the available coir husk is used to produce coir products. Hence, there is scope for growth of coir industry. 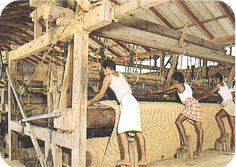 During the Seventh Plan period, encouragement has bee given for expansion of home market through publicity and advertisement, product diversification, adoption of new technology, research and development, training for artisans, including women and social welfare measures for coir workers, most of whom are SC/ST and women. The Eighth Plan programmes for coir industry aimed at increased utilisation of coconut husk for production of coir fibre, growth of the domestic market, strengthening of research and development to find out new uses of coir fibre especially in the areas of geo-fibre, fire retardant, cement and gypsum polymer development, acquiring of new technology like PVC-tufted coir products, encouragement to cooperativisation and providing social welfare, civic amenities and medical facilities to coir workers. Emphasis would be laid on mechanisation in a phased manner without affecting employment to make Indian coir products competitive in the export market. Brown coir fibre production would be encouraged by providing seed capital assistance. Modernisation of coir units has been envisaged by providing incentives for installation of modern equipments to make coir industry more competitive in the export market. Special training programmes have been formulated for women artisans. Improved modern treadle ratts would be provided to trained women artisans to increase employment and earnings. Medical facilities, creche for children of coir workers, model coir villages for SC/ST coir workers and social welfare schemes would be implemented during the Eighth Plan period. Emphasis has been given on developing devices/equipment/machinery through R&D to reduce drudgery and to improve productivity of coir workers. Development of improved variety of ratts and looms would help in improving the production of coir yarn spinning, coir mets, etc. In order to boost exports, the scheme of cooperative publicity/programme in the export markets which was started in the Seventh Plan would be continued. India accounts for more than two-thirds of the world production of coir and coir products. Kerala is the home of Indian coir industry, particularly white fibre, accounting for 61 per cent of coconut production and over 85 per cent of coir products. Although India has a long coastline dotted with coconut palms, growth of coir industry in other coastal States has been insignificant. Not more than 50 per cent of the coconut husks is utilised in the coir industry, the remaining being used as fuel in rural areas. Production in the cooperative fold is not more than 20 to 25 per cent. The development programmes so far undertaken aimed at revitalisation of coir cooperatives, improvement in quality and products diversification. 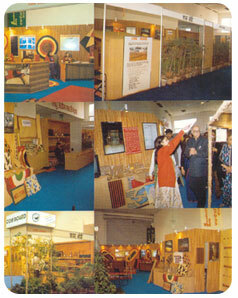 Efforts were also made for exploring wider export markets for coir and coir products. Judged from the increase in production and employment, the progress has been rather slow and exports in physical terms have remained mere or lets static.